You are currently browsing the tag archive for the ‘Daffy Duck’ tag. Following the premise of ‘The Scarlet Pumpernickel’ (1950), Chuck Jones launched a series of cartoons starring Daffy as a misguided hero and Porky as his calm side-kick. ‘Drip-along Daffy’ is the first of this excellent series, with the others being ‘Duck Dodgers in the 24 1/2th Century‘ (1953), ‘My Little Duckaroo’ (1954), ‘Rocket Squad’ (1956), ‘Deduce You Say’ (1956) and ‘Robin Hood Daffy‘ (1958). ‘Drip-along Daffy’ is a delightful and gag-rich cartoon, highlight being the strong drink scene, an elaboration on a gag Avery had made in ‘The Shooting of Dan McGoo‘ (1945). Also noteworthy is the high noon scene, in which Jones and his team indulge in numerous camera angles depicting Daffy and Canasta approaching each other. Such original and devoted cinematography was rarely been seen since the Frank Tashlin days. Nasty Canasta who would return in two more cartoons: ‘My Little Duckaroo’ from 1954 and ‘Barbary Coast Bunny’ from 1956. Chuck Jones is famous for directing cute characters, but throughout his career he directed some extraordinarily cruel cartoons, like ‘Fresh Airedale’ (1945), ‘Scaredy Cat‘ (1948) and ‘Chow Hound’ (1951). ‘The Ducksters’ is probably the cruelest of the lot, and in this cartoon the cartoon violence feels more painful than funny. 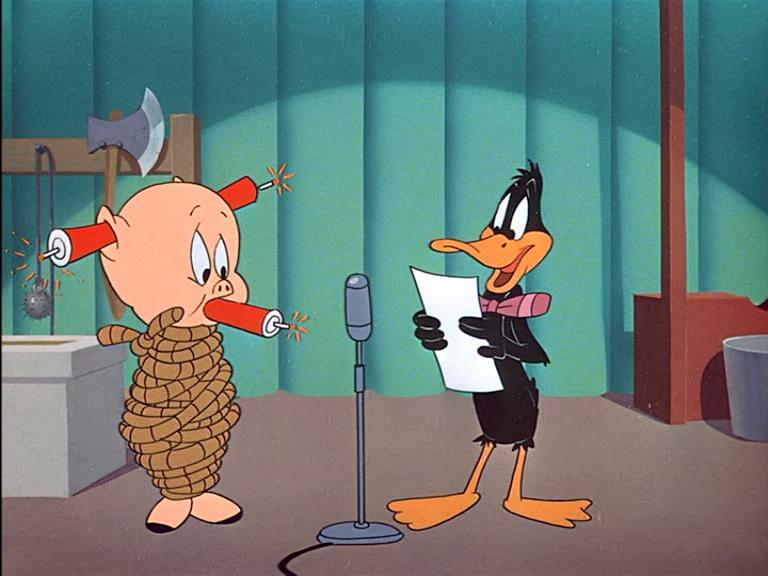 In ‘The Ducksters’ Daffy Duck is a quizmaster and Porky the unlucky contestant in the radio quiz ‘Truth or Aaagh’, an extreme take on the radio (and later television) show ‘Truth or Consequences’, which had been around since 1940. 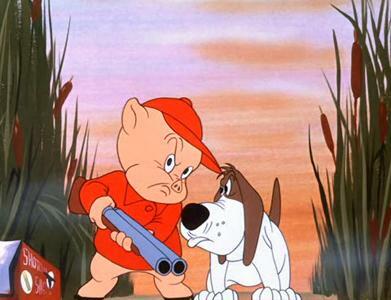 The cartoon violence starts immediately, as the opening shot features a tied-up Porky slowly approaching a sawmill. A few scenes later, Daffy shoots someone in the audience. Throughout the picture Daffy remains the ultra-violent trickster, until the tables are turned in the end. However, Daffy is neither loony nor misguided, being in the midst of a transition of character, which renders him ‘just cruel’, and very unsympathetic, indeed. 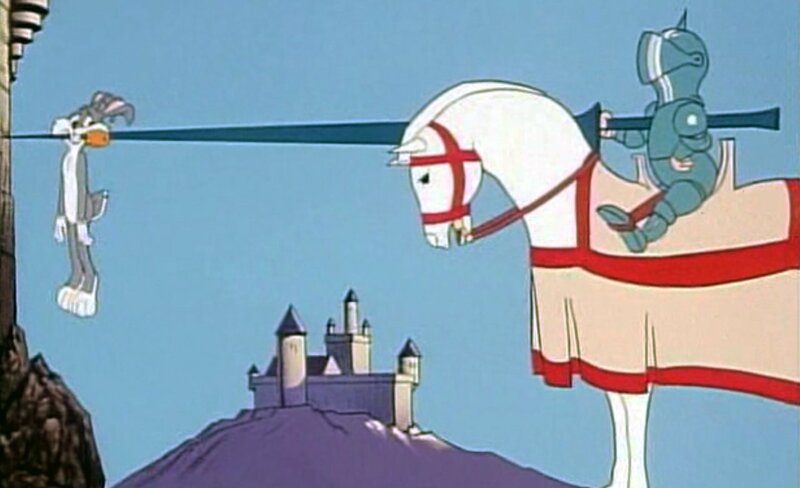 Luckily, Chuck Jones knew a better a use for the duck, using him as a misguided hero (e.g. 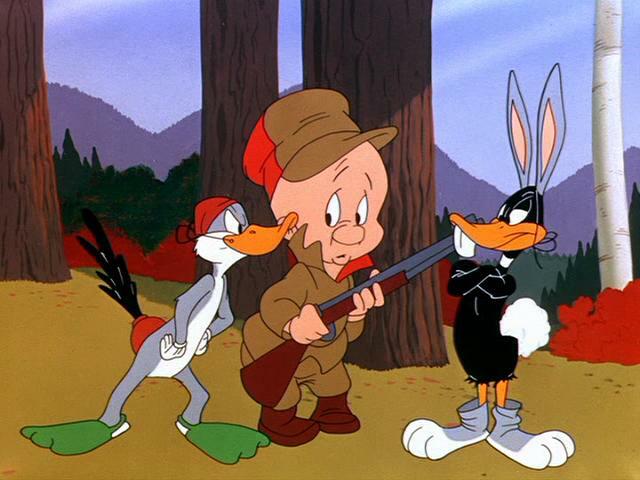 ‘The Scarlet Pumpernickel‘ (1950) and ‘Drip-along Daffy‘ (1951), or playing him against the cleverer Bugs Bunny (e.g. ‘Rabbit Fire‘, 1951 and ‘Rabbit Seasoning’, 1952). These cartoons are all far funnier than ‘The Ducksters’. Daffy Duck tricks a dog called Leopold with a ‘poisoned bone’ to let him stay at his house during the winter. Unfortunately, the dog’s owner is an evil scientist (a caricature of Peter Lorre) who happens to be looking for a duck’s wishbone. This leads to a wild chase full of pretty weird gags and off-beat dialogue penned by Warren Foster. 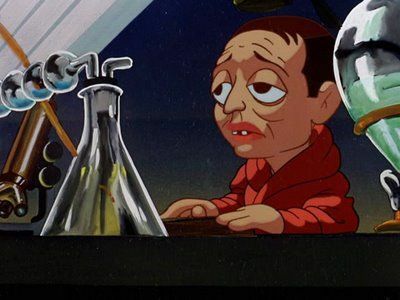 ‘Birth of a Nation’ is the second of two Warner Bros. cartoons featuring Peter Lorre as a mad scientist, the other being ‘Hair-Raising Hare’ from 1946. New voice artist Stan Freberg does an excellent job in mimicking and parodying Lorre’s typical voice. ‘Robin Hood Daffy’ is the last of Chuck Jones’s great series of Daffy and Porky pairings. 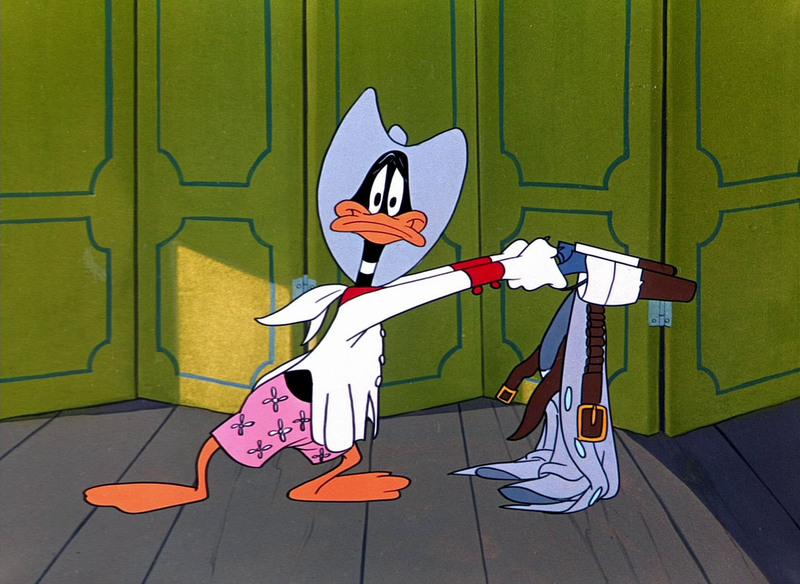 Like earlier entries, such as ‘Drip-along Daffy‘ (1951) or ‘Deduce You Say’ (1956), Daffy fails completely in acting out the hero he is supposed to be. 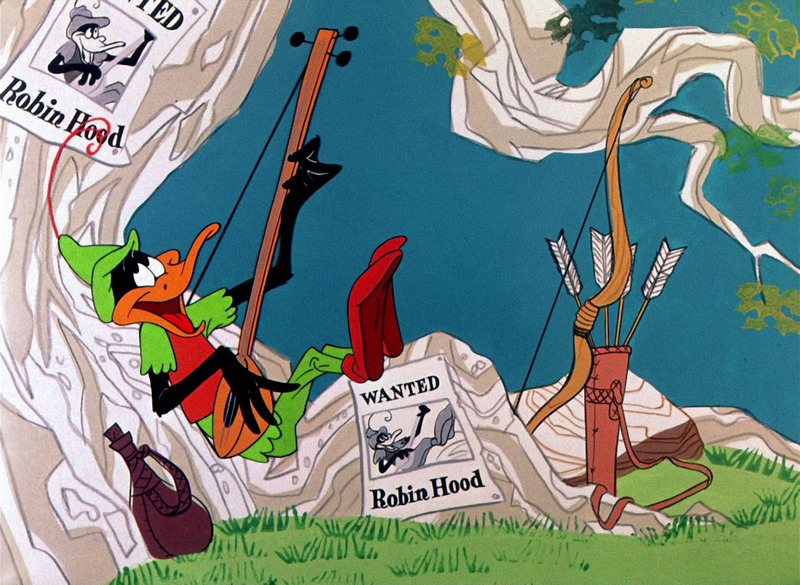 In this cartoon Daffy Duck is Robin Hood, but he has a hard time proving that to a skeptical Friar Tuck (Porky Pig). He does so by relentlessly trying to rob a rich nobleman who rides on a remarkably little donkey in a hilariously silly fashion. This nobleman character is totally unaware of the antics around him and is a late addition to a series of similar odd characters that populated many of Jones’s early films, like the Minah Bird (1941-1947) and the bearded sailor in ‘The Dover Boys‘ (1942). Daffy’s attempts, on the other hand, are more akin to those of the Coyote in the Road Runner series. The best gag is when he tries to swing on a rope, Errol Flynn-style, shouting “Yoicks and away”, only to crash into multiple tree trunks. 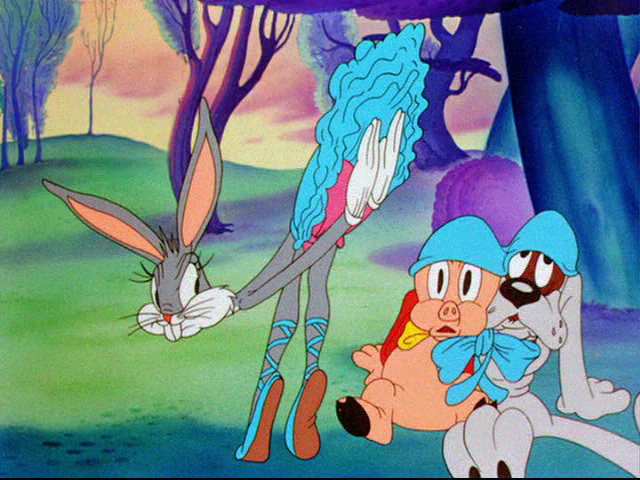 Porky is redesigned completely into Chuck Jones’s late design: with ridiculously cute eyelashes, anticipating similar redesigns of Jerry in Jones’s Tom & Jerry cartoons seven years later. The redesign is not a success: Porky looks a little too feminine and too cute for the purposes of the cartoon. ‘Duck Dodgers in the 24½th Century’ is a spoof of the popular pulp magazine science fiction series Buck Rogers, which was made into a television series in 1950-1951. 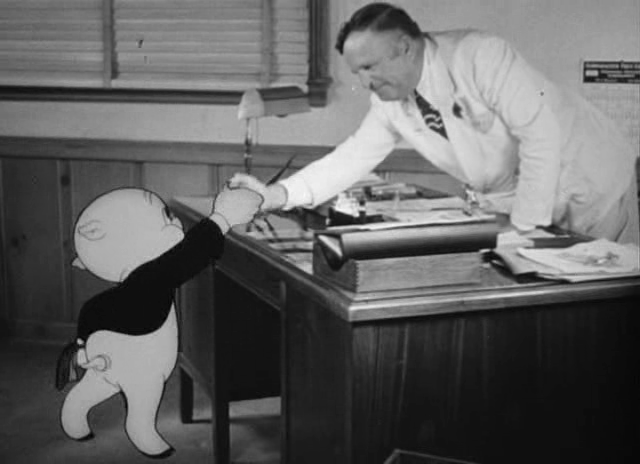 This makes this short one of the earliest theatrical cartoons parodying a television series. 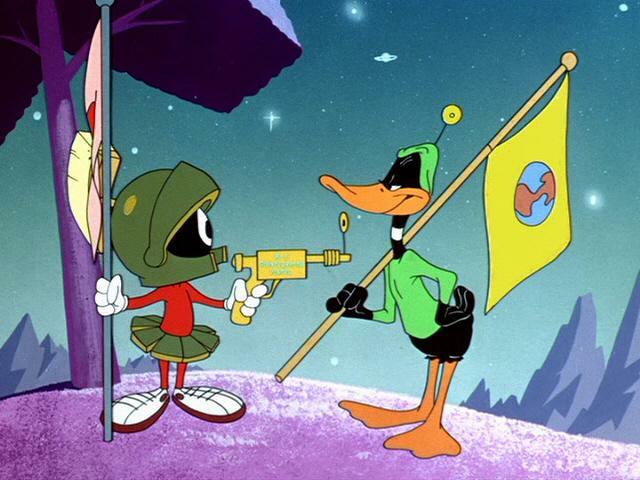 Daffy “Duck Dodgers” and his sidekick “the eager young space cadet” Porky have to claim planet X for planet Earth. Unfortunately, Marvin Martian wants to claim the same planet for Mars. This starts a feud, which ends in both blowing up the entire planet. 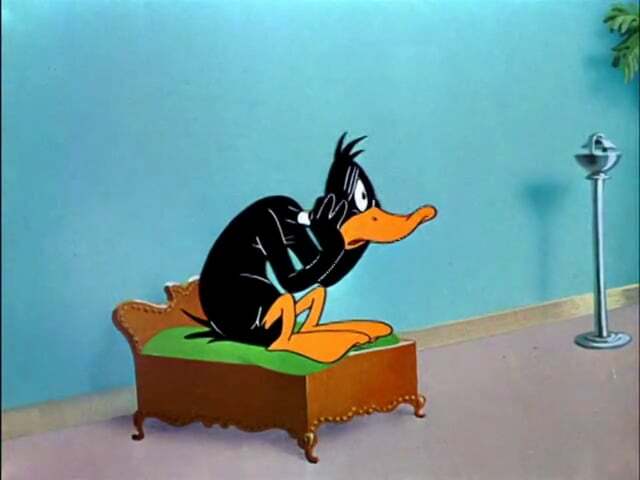 Although the story of the cartoon is rather similar to the Bugs Bunny cartoon ‘Haredevil Hare‘ (1948), Daffy’s unique performance gives it an entirely different feel, leading to new and great gags. 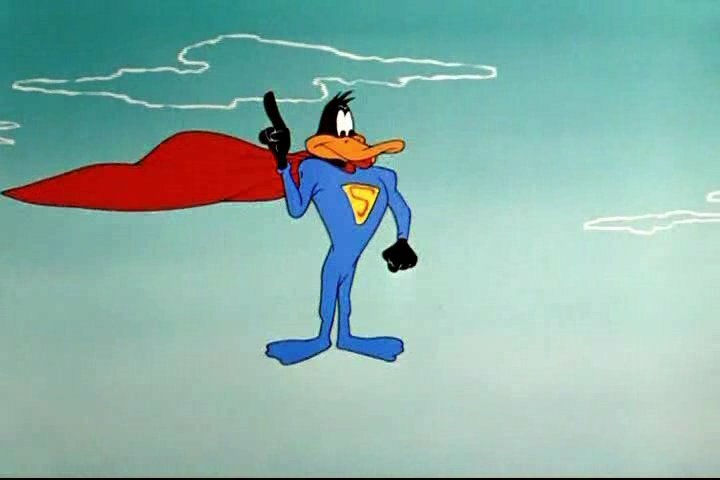 More than being a typical science fiction cartoon, this short can be regarded the second cartoon in a series which pairs Daffy as a misguided hero to Porky as a more sensible straight man (the first being ‘Drip-along Daffy‘ from 1951). ‘Duck Dodgers’ must be the highlight of the series, as well as a peak in both Daffy’s as Chuck Jones’s career. Unhampered by conventions, Jones, his layout-man Maurice Noble and background painter Phil DeGuard went totally berserk with the science-fiction theme, creating wild and lushly colored backgrounds, which make ‘Duck Dodgers in the 24½th Century’ one of the most beautiful cartoons ever made at Warner Brothers. Indeed, so great is its fame, it spawned sequels in 1980, 1996 and 2003. From 2003 to 2005 Cartoon Network even broadcasted a Duck Dodgers series. To the next Daffy Duck cartoon: Duck! Rabbit! Duck! 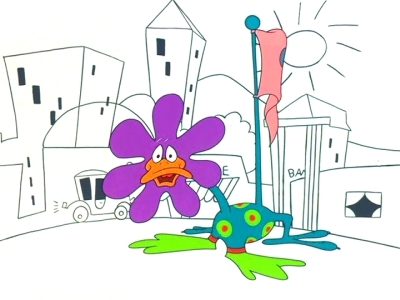 One of the most self-aware animated cartoons ever made, ‘Duck Amuck’, more than any other cartoon, plays with the conventions of animation and with the frustrations of Daffy Duck. 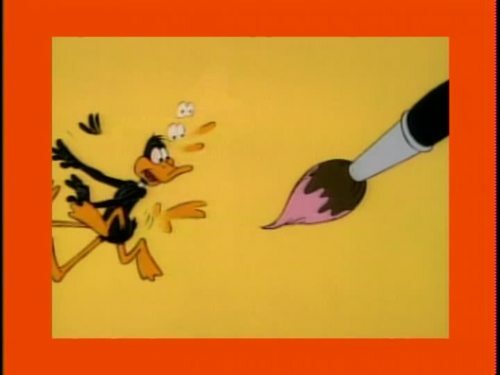 This cartoon shows how good the character is, because even when drawn awkwardly, even without sound, and even when animated as a small speck in the distance, we know it’s Daffy. His struggles with the off-screen animator (who in the end turns out to be Bugs Bunny) form the zenith of his new frustrated personality, which had replaced his zany personality of the thirties and forties three years earlier. Furthermore he’s the sole character in the entire cartoon, but so strong is his unwilling performance that we become hardly aware of this fact. The poor Daffy has to deal with disappearing and constantly changing backgrounds, with absent and inappropriate sounds, with deformations of his own body etc. In this cartoon he’s the victim of an omnipotent ‘cartoon god’ whom he cannot escape. In this sense ‘Duck Amuck’ questions the relationship between creator and creation and the responsibility of the creator to the things he created. This makes ‘Duck Amuck’ also one of the most philosophical cartoons ever made. And amazingly, it’s funny, too.